Cuba is taking actions to boost artificial fish raising to increase food supply on the domestic market. 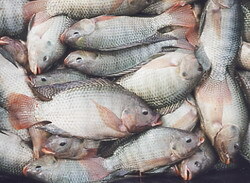 As part of that strategy, a major program to raise tilapia artificially for the domestic market and export is being carried out in the eastern Cuban province of Camagüey. Precisely, some 800 cages were installed in that province to obtain nearly 600 tons of fish, 130 of which have already been produced. According to statistics, 50 percent of this year's production of red tilapia in Camagüey will go to the domestic market, and more than 30 percent will be exported. The rest will go to social programs sponsored by the government in the province. Statistics from specialized agencies show that aquiculture contributes nearly 30 percent of fish consumption in the world.